One way to improve program delivery could be an electronic payments system with biometric authentication that deposits government transfers directly into people’s bank accounts. By verifying recipients’ identities using fingerprint readers at the time of withdrawal, the system could help ensure that intended recipients are actual recipients. However, these systems can be complex and difficult to implement, and little rigorous evidence exists about their impact on payment delivery. For example, beneficiaries might be denied payments if they are unable to enroll, or corrupt officials may undermine the new system. Given the technical and political challenges, the cost-effectiveness of a biometric payments system is unclear. In 2006, the Government of Andhra Pradesh3 launched the Smartcard system, India’s first large-scale biometric payment system, to improve the delivery of two major social welfare programs: NREGS, which guarantees rural households 100 days of paid employment annually, and SSP, which makes monthly payments to elderly, widowed, and disabled individuals below the poverty line. 1. Technology Change: Beneficiaries provided biometric data (ten fingerprints and a digital photograph) to create uniquely identified Smartcards linked to newly created bank accounts. Beneficiaries could use these cards to obtain money directly from customer service providers located in each village. Implementation challenges related to payment logistics stalled the Smartcards’ initial launch in several districts. In 2010, leveraging previous successful collaborations,4 researchers worked with GoAP to relaunch the program in eight districts and test its effectiveness through a large-scale randomized evaluation reaching nineteen million people. Over two years, the Smartcard system was introduced across 296 randomly assigned sub-districts. After the two years, researchers compared payments and funds disbursed in sub-districts chosen to implement the system earlier (the treatment group) with those in sub-districts where the system was not introduced until after the evaluation (the comparison group). They measured impacts on payment logistics, leakages, and program access. To address these leakages, the Smartcard system introduced: (1) a technological reform in which beneficiaries who chose to enroll received biometrically authenticated identification cards, called Smartcards, linked to bank accounts, and (2) an organizational reform in which payment logistics were contracted to private banks and customer service providers (CSP) in each village. Banks were rewarded a 2 percent commission on all payments delivered. The Smartcard system was only partially implemented. After two years, only 67 percent of villages in the treatment group were using Smartcards for NREGS (79 percent for SSP) and only half of all payments were made using the new system. These results reflect significant implementation challenges particularly related to enrolling beneficiaries, who often missed initial enrollment drives for the new system. Despite partial implementation, the new system substantially improved the payment process by reducing delays and the unpredictability of payments. Under the new payment system, NREGS workers spent 22 fewer minutes collecting payments (a 20 percent decrease relative to the comparison group collection time of 112 minutes) and received their payments 6–10 days sooner. Payments also become more predictable as the variation in the length of delays fell. These changes affected both workers with and without Smartcards, suggesting that improvements were driven by the organizational reform rather than the Smartcard technology. Smartcards also reduced leakages, increasing the payments that beneficiaries received. NREGS participants with Smartcards reported 24 percent higher weekly earnings of INR 35 (US$0.72 at the time of evaluation), while SSP beneficiaries reported a 5 percent increase of INR 12 (US$0.25). Importantly, official government disbursements did not change for either program, implying a 41 percent decrease in NREGS leakages and a 47 percent decrease in SSP leakages. There was no evidence of reduced leakages for beneficiaries without Smartcards, suggesting that the biometric authentication was the main driver in decreasing leakages. Beneficiaries overwhelmingly preferred the new system. In follow-up surveys, 90 percent of NREGS participants and 93 percent of SSP beneficiaries in treatment areas indicated that they preferred Smartcards to the old system, largely because payment collection was easier, faster, and less susceptible to manipulation. Smartcards did not reduce program access. The Smartcards system had no impact on access to the SSP program and increased access to NREGS; 7 percent more households reported participation in NREGS compared to 42 percent in the comparison group (a 17 percent increase). Researchers found no evidence that the Smartcards negatively affected vulnerable households such as the extremely poor. Overall, Smartcards were cost-effective and generated large savings in the short term. Implementing Smartcards in the eight districts cost an estimated US$4 million for NREGS and US$2.3 million for SSP annually. But this was offset by an estimated US$38.5 million annual decrease in leakages for NREGS, and a US$3.2 million annual decrease for SSP. Researchers estimated that the gains from beneficiaries’ time-savings in the NREGS payment collection process alone, at US$4.5 million, exceeded the cost of the new system. Biometric payment systems can improve program delivery without excluding vulnerable households. Even partially implemented, the Smartcard system significantly improved program delivery and reduced corruption. Importantly, these improvements occurred without hurting or excluding any beneficiaries. Researchers believe this was, in part, because GoAP did not make the biometrically authenticated card mandatory for collecting payments, so that beneficiaries who did not (or could not) enroll could still receive payments. Policymakers should consider strategies, such as gradual implementation or incentives for implementers, to align key stakeholders’ interests and mitigate the challenges of payment system reforms. Despite senior leadership support and substantial administrative resources behind the program, GoAP found implementing the Smartcard system difficult. Gradually rolling out reforms can allow local officials to better understand and manage implementation details. By providing commissions on successfully delivered payments, GoAP also incentivized banks and CSPs to correctly implement the system. These strategies aided the transition to the Smartcards, aligning stakeholders’ incentives and allowing time for adjustment. Investments to improve poor state capacity for program delivery can generate significant benefits even in the short term. While investing in state capacity can be costly, the Smartcard system generated more than US$40 million in savings from reduced leakages, demonstrating that there can be significant short-term returns to improved program delivery. Importantly, a secure payment infrastructure is a public good that improves not just government programs but could also facilitate transactions for the private sector and individual citizens. Rigorously evaluating the rollout of a large-scale program can be a powerful way to monitor its impact and ensure that widereaching policies are informed by evidence. In 2013, after receiving overwhelmingly negative feedback from local officials, GoAP nearly stopped the reforms—until officials reviewed this evaluation’s results on program improvements and beneficiaries’ high satisfaction rates. Since then, the evaluation has informed a national policy on biometrically authenticated identification cards, demonstrating the policy value of rigorous, large-scale evaluations. This evaluation has since informed the Government of India’s Aadhaar initiative, a national policy providing every Indian resident with a biometrically linked identification card. 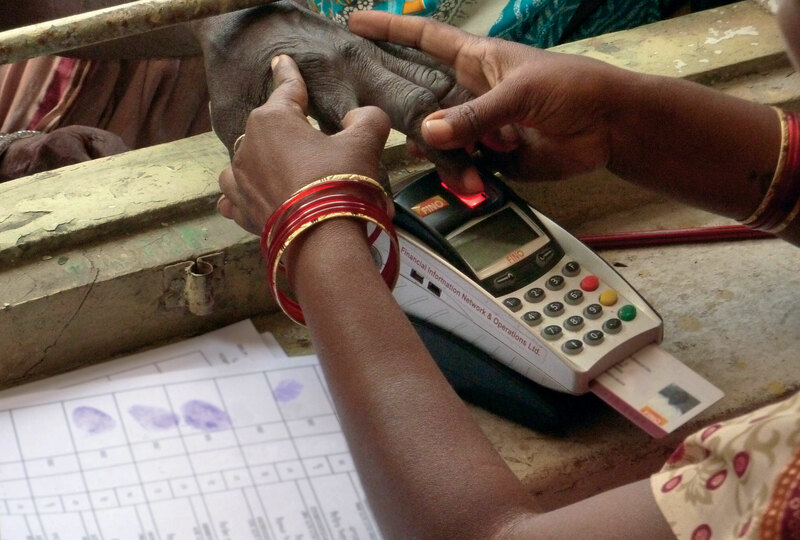 The Ministry of Finance cited the study in its 2014–15 and 2015–16 Economic Surveys—annual reviews of the Indian economy—to advocate for the use of biometric authentication in program delivery across all anti-poverty schemes. In 2016, the Government of India passed the Aadhaar Act, which provides legal backing for the use of these identification cards in the delivery of national benefits, subsidies, and services. Karthik Muralidharan, Paul Niehaus, and Sandip Sukhtankar. "General Equilibrium Effects of (Improving) Public Employment Programs: Experimental Evidence from India." Working Paper, September 2017. Muralidharan, Karthik, Paul Niehaus, and Sandip Sukhtankar. 2016 “Building State Capacity: Evidence from Biometric Smartcards in India.” American Economic Review 106(10): 2895–2929. 1Government of India. 2017. “Expenditure on Subsidies for the Poor and Social Assistance Programs.” in Expenditure Budget Vol. I, 2016–17. New Delhi: Government of India, Ministry of Finance. 2For example, for leakages in NREGS see: Imbert, Clement, and John Papp. 2016. “Estimating Leakages in India’s Employment Guarantee: An Update.” For leakages in the Public Distribution System (India’s subsidized food program) see: Government of India. 2005. “Performance Evaluation of Targeted Public Distribution System.” New Delhi: Programme Evaluation Organisation, Planning Commission. 3In 2014, Andhra Pradesh was separated into two states—Telangana and Andhra Pradesh. This summary refers to the formerly unified Andhra Pradesh. 4Previous work by J-PAL affiliates in Andhra Pradesh includes evaluations on school choice and performance pay for teachers. 5Dutta, Puja, Rinku Murgai, Martin Ravallion, and Dominique P. van de Walle. “Does India’s Employment Guarantee Scheme Guarantee Employment?” World Bank Policy Research Working Paper # 6003, March 2012. Niehaus, Paul, and Sandip Sukhtankar. 2013. “Corruption Dynamics: The Golden Goose Effect.” American Economic Journal: Economic Policy 5(4): 230-269. Pai, Sandeep. 2013. “Delayed NREGA payments drive workers to suicide.” Hindustan Times, December 29, 2013. Accessed March 1, 2016.